Alcohol abuse is a tale as old as time, and Alcoholics Anonymous (AA) has been around since the 1930s. But scientific breakthroughs in the last few decades have brought about effective alternatives to AA. Life-changing medications have been FDA-approved and available for use to treat alcohol use disorder (AUD) for many years, but society—including the medical establishment—is only just catching up. Here’s how modern methods of alcohol abuse treatment compare to the older way of doing things. Many AA members rely on AA alone to stay sober. Attending organized group meetings, being mindful of the 12 steps, and working with a sponsor—that’s it. But that doesn’t work for everyone. As described in the big book of Alcoholics Anonymous, AUD is an illness. And as with many other illnesses, scientists have worked for decades to locate its physical attributes and develop medications to treat it. FDA-approved medications for AUD include acamprosate, topiramate, gabapentin, and naltrexone. They’ve been shown time and again to prevent full-blown relapse by significantly reducing the urge to drink. People don’t have to rely on willpower alone. And the health benefits of slashing the number of drinks per day outweigh any minor drug side effects. Weekly AA meetings can be immensely helpful. Tapping into a community of people who’ve had relatable experiences with alcohol addiction can create a sense of support and connectedness that no doctor can provide. But while AA is helpful and encouraging for some, it is definitely not for everyone—especially the more socially anxious among us. Not everyone feels comfortable talking about their personal struggles in a group setting. Another standard treatment option is a rehabilitation facility, or “rehab.” But rehab takes a lot of time and, depending on your insurance, a lot of money. For most people, shelling out hundreds of dollars a day is not an option—not to mention taking weeks or months off of work. With modern telemedicine apps, medical consultations can be done on your phone, saving a lot of time and money without compromising on quality of care. One study from 2016 found that telemedicine was cheaper than standard substance abuse treatments, and also much more effective. Thousands of people use telemedicine apps to replace primary care visits, and now there are options to get online help for alcohol addiction. The only requirement for AA membership is a desire to stop drinking—”stop” being the key word. A single drink is considered a failure, and anytime you drink you’re expected to restart from scratch. 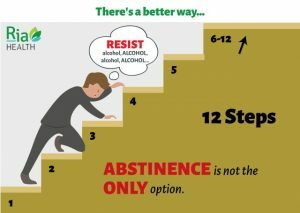 But some people simply want to reduce their drinking, while still being able to drink in social settings or on special occasions without going overboard. In an interview, Ria Health’s Chief Medical Officer, Dr. John Mendelson, explains that abstinence-based programs have a high failure rate. People are released from them without having changed their body’s reaction to alcohol—so the same behavior creeps back in. Medications like naltrexone and treatment plans like The Sinclair Method help you to drink less. They reduce your cravings by helping you feel the “stop” signal before you’ve had too many. They can also help you remain sober if that’s your goal. The beauty of it is, it’s up to you. At Ria Health, we don’t think people who want to reduce their drinking should have just one option. Often, changing your relationship to alcohol impacts all areas of your life. Many of our members see great results with just our medically managed program. Our method includes one-on-one consultations with doctors experienced in treating AUD, and regular check-ins with coaches who specialize in changing behaviors around alcohol consumption. But others opt to use our program in combination with individual psychotherapy, or with a recovery community like AA. And we fully support those options. We want our members to feel as comfortable and confident as possible on their journey toward a healthier relationship with alcohol. And we use all of the latest scientific tools available to help our members reduce their drinking and live healthier, fuller lives. To learn more about how Ria Health helps people to moderate their drinking, visit here. Interested in getting started in our program? Click here.